Get the facts about the latest government changes affecting these mandatory forms. Listen to Jaime Lizotte, HR Solutions Manager, answer key questions from our tax filing webinar in this Q&A session. What’s the deadline to e-file the 1099? A. The deadline to e-file the 1099 form for the upcoming tax season, and this deadline is issued by the IRS, is January 31. This deadline is two months earlier than last year, so for those businesses that are used to e-filing and having the extra time after preparing a recipient copy, this is a very big deal. You want to make sure you’re ahead of the game, and that you’re prepared to meet that deadline. What about W-3s? Does the site automatically generate these forms? Yes, when using the eFile4Biz website and e-filing your W-2s, the site does automatically generate a W-3, to send to the IRS; However, users can still print out a total report of all the W-2s they file, which is essentially the same information a W-3 transmittal form contains. When filing your W-2s and 1099s, what if you’re not aware of an error until after the January 31 due date and you need to file a correction? Is this an automatic penalty as well? Once you recognize there was an error filed, regardless of the date you recognized it, you should automatically proceed to file a correction form so you can submit it to the IRS as soon as possible to avoid any possible penalties. We cannot assume there will be automatic penalties when filing a correction form right after the deadline; that’s for the IRS to assess, but it’s definitely best practice to get your correct, or corrected, forms in to the IRS as soon as possible to avoid any possible penalties. Would you need paper forms, etc., ​or can you print out the 1099 online, and not use that specialized paper? When filing online and using eFile4Biz, that’s actually one of the benefits. You don’t have to purchase special paper or forms to print out the copies. You can just access your account and print on regular white paper. How do I update last year’s recipients and/or company info with this year’s data? Just log into your eFile4Biz account and go to the Manage Payers and Recipient tabs. Select the payer/company you need to edit, click edit (the pencil icon) and then make your changes and save them. If you’re editing a recipient, once you select the payer/company, you would then see your list of recipients and click edit for that specific recipient, make your changes and save them. Is there a way to export to Excel the data that was filed in a previous year? When it comes to exporting, unfortunately, the data cannot be exported from your account. But, you can print out the form and/or the summary report, for up to the last four years. Even though the output is not in an excel format, you’re still able to print out the forms and/or reports so you can have the data saved in separate file. Do you help with ACA codes? 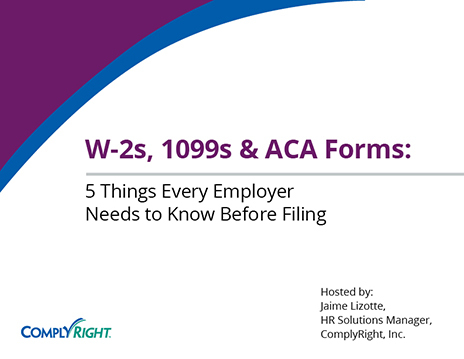 As for ACA filing, we know these codes can get so confusing, and there are a lot of codes, when working with the 1095C, which is the form the codes correspond to. These codes specifically refer to boxes 14 and 16 on the form. However, on the eFile4Biz site, there are links right above the form that display both box 14 offer of coverage code, and box 16 the applicable section 4988 safe harbor code and the definitions of each. These links can be accessed while you’re filling out the form to make sure you’re selecting the right code. It's a great tool. When using the eFile4Biz site, no software is required, and there is no installation either. That’s the great thing about e-filing. All you need to do is open up a Web browser, go to the site and log in. It’s really that easy. Yes, we do integrate with Xero on the eFile4Biz site so for those who use Xero payroll and we also integrate with QuickBooks online. eFile4Biz also has an app that you can install on your desktop to pull your 1099 data from QuickBooks Desktop Pro if you’re using that program, so there are a few applications for which the site integrates. Any ACA reporting required for fewer than 50 employees? Any employers with fewer than 50 employees are only required to report if they are self-insured. A self-insured employer is one that covers the cost of healthcare for its employees. So, instead of them buying health insurance through a third party like BlueCross BlueShield, for example, the employer actually sets aside funds to cover their employee’s medical expenses. If an employer is self-insured and only has 10 employees, they are required to report, but if an employer offers health insurance through a third party like BlueCross BlueShield, they don’t have to report if they have fewer than 50 employees. In the event that a 1099-MISC recipient has moved, would the 1099-MISC form come back to the issuer if you choose to use eFile4Biz or ComplyRight as your provider? You would need the return 1099-MISC to prove that you tried to comply with issuance. I’m assuming that the updated address wouldn’t be on the envelope for that recipient and that is correct. When using eFlie4Biz, for e-file, print and mail, if a form is undeliverable, then it will be mailed back to the payer or company’s address. In this case, if an accountant is filing for several clients, the form would not go back to the accountant, it would go back to the company that the accountant is filing for. It will go back to the company so they will have proof of that filing, unless they go ahead and readdress it if they have that recipient’s new address. They can readdress it and send it out, but if not, at least they have proof they did try to deliver within the deadline.